If walls could talk… With a nod to Mike Doud and Peter Corriston's classic album cover for Led Zeppelin's "Physical Graffifi", windows of a building reveal strange and exotic happenings. 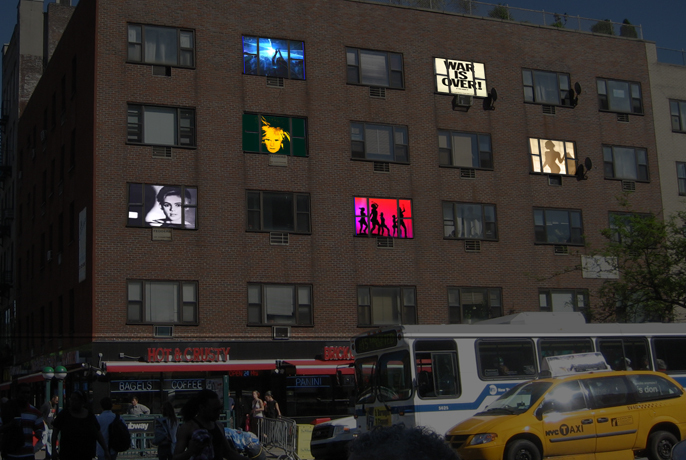 Video projections celebrate the eclectic history and current vibrancy of 14th Street with images of Andy Warhol's Factory, Bettie Page, burlesque, vaudeville, silent movie studios, dance halls, rock concerts, Union Square protests and Boss Tweed's Tammany Hall. Art in Odd Places, NYC’s annual public art and performance festival, announces its 2009 season: SIGN with more than 60 artists and performers. Once again, from October 1 through 26, Art in Odd Places (AiOP) brings art into the public life of 14th Street, infusing its everyday rhythms and spaces with ideas, imagination, humor, and politics, and encouraging its residents, workers, and visitors to experience it anew. 2009 guest curators: Erin Donnelly and Radhika Subramaniam. Crossings Condominiums Residents: Thank you for your windows and your lust for life! 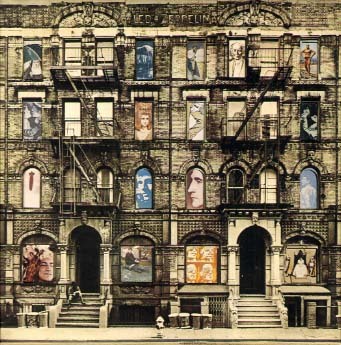 Mike Doud and Peter Corriston created the album cover for Led Zeppelin’s “Physical Graffiti”, released in 1975 depicting a building located at 96-98 St. Mark’s Place, NYC. The cover has die-cut windows that reveal a variety of eclectic images including historic and notorious individuals suggesting the exotic lives and happenings of the New Yorkers inside the building. It is a "double-album", and the images are interchangeable by switching the album sleeves around. Now even the building is somewhat notorious with a clothing store called “Physical Graffiti” in the basement and Led Zep fans making pilgrimages to the site and posting photos of it online. In the ‘80s the building was featured in the Rolling Stones’ video “Waiting for a Friend”. Peter Corriston also designed the album covers for the Rolling Stones' "Some Girls", "Emotional Rescue", and won a Grammy for "Tatoo You". © 2009 Pam Payne. All rights reserved.